There was a little frisson of excitement at the end of last year's Australian International Beer Awards. For the past few years, it has been practice for the Champion Australian Breweries to join forces to create a collaborative brew to be launched at the following year's dinner. With Thunder Road Brewing named as Champion Medium Brewery and CUB taking out the Large Brewery title, it raised the prospect of two breweries who knew each other best from a bitter court battle in which the former tried, ultimately unsuccessfully, to seize control of several dozen of the latter's unused brands. But, being beer, the spirit of brotherhood won out and earlier this year brewers from Thunder Road and CUB headed to 3 Ravens in Thornbury to create Girt By 3. Just as the brewers represented old and new, so did the beer they designed. And, with them all being Victorian, the ingredients were sourced locally too: a single malt variety called Westminster and experimental hop varieties from Hop Products Australia that were added to the beer in whole flower form (along with some old school Pride of Ringwood for bittering). 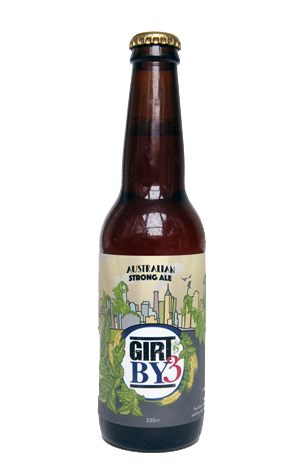 The base beer – an Australian strong ale – was blended with three aged beers from the participating breweries: a double IPA from 3 Ravens; some of the 2012 Crown Ambassador from CUB; and a barrel-aged imperial Kolsch from Thunder Road. The result is a full-bodied to the point of pillowy beer in which the fruity characters of the experimental hops play second fiddle. To the fore are layers of complexity drawn from the blended beers: hints of sherry, oak and heaps of smooth toffee among some rather quirky elements, plus a slowly building spicy heat in an incredibly bright copper coloured brew so rich you can practically eat it.